The OK Baby Cabinet is equipped with its own mono/stereo amplifier (please keep the volume of the output of the main board below 10W and adjust volume to the desired level by the amplifier on the power supply). 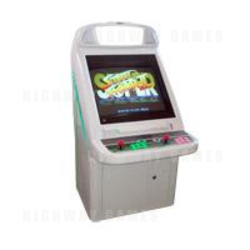 The cabinet also features a 29 inch CRT dual frequency monitor (15kHz - 25kHz) and owners can also get an added base for the cabinet for extra height if needed (the base brings the height of the machine 167.5cms without header). The control panel features 2 players control - 1 and 2 player start buttons, 2 joysticks, and 6 push buttons per player - and the Weche OK Baby cabinets also use a unique feature for accessing the inside of the panel and the monitor; the front panels and shroud opens moving woutwards and up and is supported fully self supported. Plus, the Weche OK Baby internal header is a lighted header and is fitted in the center top of the machine, with a stereo speaker on each side, and owners can place their own game headers or promotion materials in the header.